My name is Shauna and I love Kimchi! I’ve just read an article about the rise and rise of Kimchi. Here is the link . When first I arrived in Korea, my nose followed the curious smell that simply hung in the air at meal time. I didn’t have to go to far to realise that Kimchi was the source and that any negative thoughts should be kept to myself for fear my lack of love for this unique dish was grounds for deportation. That’s how much the Koreans love Kimchi. My food teaching revolved around the word Kimchi. “What did you eat for breakfast? Kimchi and rice. What did you eat for lunch? Kimchi and rice. What did you eat for dinner? Kimchi……………and rice” Can you see the trend here? No other food is actually worth mentioning or eating in the eyes of a 6 year old Korean child. I simply couldn’t take to it. It was a mental block, really. What put me off was that it was cold and all there in one big pile together. And the smell. Urgh, that smell. I would be a cast off, sitting, eating my bland lunch of rice and vegetables desperate for a bit of flavour. For the longest time I stayed strong but the more and more Korean friends I made, the more it became next to impossible to avoid it. It’s everywhere, especially if we went out to a meal together. Eventually, I started eating Kimchi Jigae (Kimchi soup) which is cheap and cheerful and puts a fire in your belly, the perfect Sunday morning hang over cure. This escalated to mixing some with rice at lunch time and now, I simply cannot imagine my life without Kimchi. This year, when Kimjang (Kimchi making) was finished, my landlady presented me with the biggest container of Kimchi you’ve ever seen. Daunted by the task of having single handedly eat a mountain of Kimchi, I first took the natural decision to share it out among my friends. Turns out not many of my foreigners friends are partial to the old bit of Kimchi so my mountain was still a mountain after sharing. Taking one for the team, I set out to eat it all and there are so many dishes you can make with Kimchi that I think I’ll run out before I try them all. My personal favourite is Kimchi Jigae. Easy to make with hardly any preparation time, this is the perfect dish after a day at work. And if you already have the Kimchi, you simply need to add a little tofu or a few spices or beans or whatever you have in the press to add that extra flavour. Next is Kimchi Spaghetti/pasta. So delicious, easy to make and especially flavoursome if you add cheese. Sometimes, if I’m going all out Kimchi and ramen is super delicious with cheese on the top. As a world’s biggest fan of potatoes, Kimchi is the perfect addition. Mashed potatoes and Kimchi, baked potatoes and Kimchi, chips and kimchi, potato salad and Kimchi, colcannon and kimchi, potato pie and kimchi, just so many things, the list goes on and on. You can simply eat Kimchi and cheese on toast. Delicious, nutritious and so easy to make. That’s a recent addition to my Kimchi list. There are a million others including one dish I like to call “Simply Kimchi”. 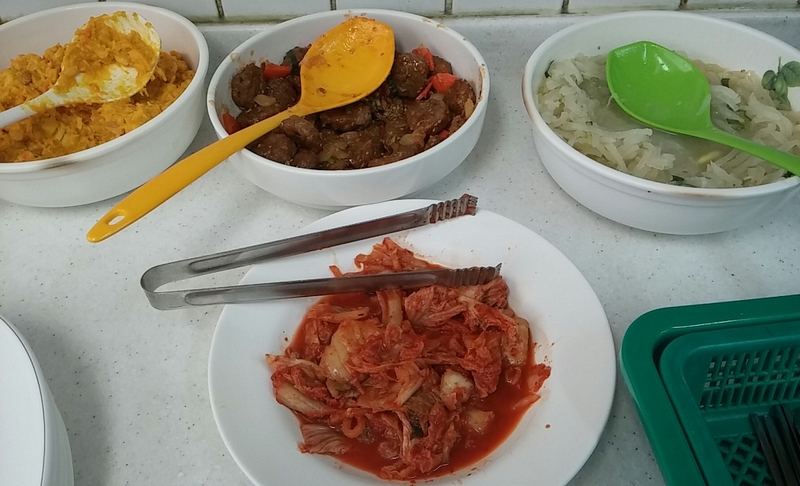 Some can tell the difference between the different types of Kimchi but I don’t think I’m quite at that stage yet, hence failed one requirement of bring a Kimchi Grand Master like the adjumma in the article. Never mind, I’ll continue to eat my Kimchi and encourage other foreigners I meet to do like wise.